Last time we went over some ways to distinguish the Northern fur seals from the California sea lions in our marine mammal center. Today, we're going to learn how to identify each animal. Once you know which species you're looking at, the next way to narrow it down is by size. Some of our animals are still growing, so this will change as they get older. Let's start with the Northern fur seals. Currently, from largest to smallest, there's Commander, followed by Ursula, Chiidax and finally Kitovi. Adult males can grow up to 600 pounds! This is why Commander is the largest. He is currently our only adult male. In comparison, adult females, like Ursula, reach only 100–120 pounds when full grown. Chiidax turned 2 years old this year. It won't be long before he's bigger than the adult females. Because of this, size is not the only way to tell our animals apart. 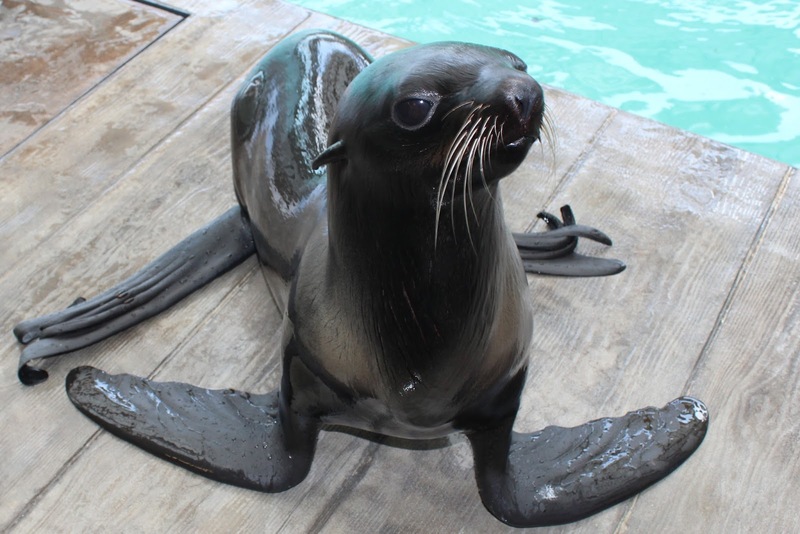 Our two California sea lions, Zoe and Sierra, are both smaller than Commander, but larger than all the rest of the fur seals. Female California sea lions average around 250 pounds when full grown. At 5 years old, Sierra and Zoe are young adults just under 200 pounds. In addition to being the largest on exhibit, he has longer hair on the back on his neck. Ursula has a light patch of fur on her chest, and medium length whiskers. These are our two smallest fur seals. They both have black whiskers and lighter patches of fur on the chest and cheeks. Chiidax has longer ears that stick way out. He is stocky and little larger than Kitovi. Kitovi is more petite and sleek looking. These two may be the most challenging to tell apart, even for their trainers. They are the same age and look very similar physically. a dip in her snout before the end of her nose. Sierra has a slightly flatter nose. Even though our sea lions look a lot alike, they have very distinct personalities, mannerisms and even vocalizations. As trainers, we spend a lot of time getting to know our animals and use these in addition to their physical characteristics to tell them apart. Watch and listen to this video to hear the difference between the vocalizations of Sierra and Zoe. Now that you know what to look for, test your skills and see if you can tell who is who during your next visit to the Aquarium! How can you tell the harbor seals apart? Stay tuned, we're working on that post, too!